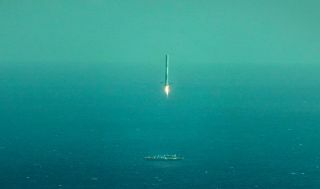 This image taken by a chase plane shows the first stage of SpaceX's Falcon 9 rocket attempting to land on a robotic ship in the middle of the Atlantic Ocean on April 14, 2015. A stunning new video shows just how close SpaceX came to pulling off a historic rocket landing Tuesday (April 14). SpaceX tried to bring the first stage of its Falcon 9 rocket back for a soft touchdown on an "autonomous spaceport drone ship" in the Atlantic Ocean during Tuesday's successful launch of the company's robotic Dragon cargo capsule toward the International Space Station from Cape Canaveral Air Force Station in Florida. The rocket did indeed land on the ship — which is named "Just Read the Instructions" after a vessel in the sci-fi novels of Iain M. Banks — but toppled over shortly after touching down. Video taken by the landing ship won't be available until it reaches port in a few days, SpaceX founder and CEO Elon Musk tweeted Tuesday, but dramatic footage from a chase plane has already come in. "Falcon 9 first stage landing burn and touchdown on Just Read the Instructions," SpaceX representatives tweeted about the new video, which they also posted on Twitter. The first attempt had a similar outcome: The Falcon 9 first stage hit its target but came down too hard and exploded on the deck of "Just Read the Instructions." The rocket's stabilizing "hypersonic grid fins" ran out of hydraulic fluid during the Jan. 10 try, Musk has said. SpaceX fixed that issue in the leadup to Tuesday's launch, company representatives said. At the moment, it's not clear what prevented a successful touchdown this time around. "We're still looking at data; we need to analyze what happened," Hans Koenigsmann, SpaceX's vice president of mission assurance, said during a postlaunch news conference Tuesday. "It certainly needs more work in the next couple missions." The next drone-ship landing attempt will come during the launch of the next Dragon resupply mission, Koenigsmann added. That flight is currently scheduled for June 19. SpaceX holds a $1.6 billion NASA contract to fly at least 12 resupply missions to the orbiting lab. Tuesday's liftoff kicked off the sixth of these cargo runs.